The Department of Distance Education seeks to educate and develop leaders for service at the strategic level while advancing knowledge in the global application of landpower. The Distance Education Program (DEP) at the US Army War College allows you to participate in a two-year, rigorous program of instruction that results in the award of the same Graduation Certificate and the same fully-accredited Master of Strategic Studies degree awarded to graduates of our resident program. The DEP is also accredited by the Chairman, Joint Chiefs of Staff, as a program for joint education, Phase I Senior Level (JPME I) and for selected students in Phase II Senior Level (JPME II). At last, you can receive at any duty station or remote location, the same high-quality instruction delivered here at Carlisle Barracks. 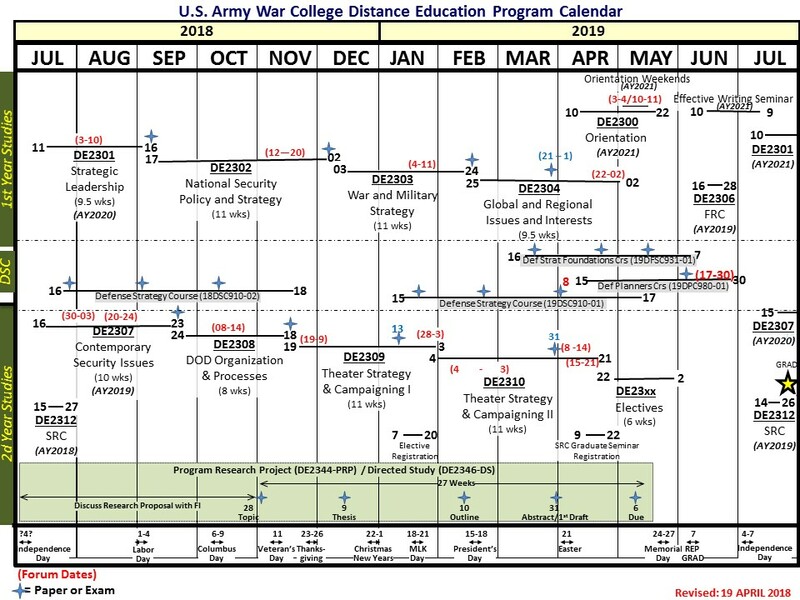 The Distance Education Program allows you to work a regular full-time job and still make time for a War College degree. You will need to devote 15 hours each week to a program that is delivered to you via the Internet, one that leverages technology to enhance the educational experience. Under the "Curriculum" link to the left, you will find a brief overview of the program and many of the issues that are a part of our program of instruction. The department also offers a four-month, online Defense Strategy Course (DSC), a ten-week, online Defense Planners Course (DPC), and a twelve-week, online Defense Strategy Foundation Course (DSFC). DSC is designed for majors and lieutenant colonels desiring to learn how the nation develops national security policy and strategy. DPC is designed for majors and lieutenant colonels (or equivalent level civilians) that operate in and conduct joint operational planning. DSFC is designed for GS 14 and 15 level civilians from the Defense Senior Leader Development Program (DSLDP) focusing on the National Security Strategy policymaking process and the relationship of the national instruments of power to defense strategy. Please view the "Curriculum" link on the left and expand the "Defense Strategy Course", "Defense Planners Course", or "Defense Strategy Foundation Course" links at the bottom of the page to view more about these course offerings. The DEP is designed to be provocative, demanding, and rigorous. You will be in a class of highly intelligent professionals who seek to hone their intellectual skills and professional competency. You will be challenged academically, but there are teams of trained professionals to assist you as you wrestle with many of the complex issues of today's global situation. Your view of many issues may change as you work through the program. Here, there are at least two sides to every issue and often, there are no school solutions. Is this program for you? Do you want to know more? Click on the buttons above to learn more about this unique academic program! Please select an item of interest from our course materials below. Please select an item from our resources below. Please select the assistance you require from the list below to help us establish the appropriate contact for all your needs. For all program and curriculum questions please contact the Department of Distance Education central office at usarmy.carlisle.awc.mbx.atwc-ade@mail.mil. For all enrollment and admissions questions please contact the Registrar's Office at usarmy.carlisle.awc.mbx.registrar@mail.mil. For all login, password, and access questions please contact the Service Desk at usarmy.carlisle.NETCOM.mbx.nec-service-desk-email@mail.mil. Scroll or swipe for more content. The Army War College does not accept individual applications into its SSC programs except through special exceptions. A DA-centralized board is held on behalf of the CAR to identify officers to attend SSC. USAR officers are selected according to AR 350-1. Commissioned officers from all components should remember that according to the provisions of AR 350-100, attendance at the Army War College incurs a 2-year service obligation. U.S. Army War College Distance Education Course allows you to participate in a 2-year, rigorous program of instruction that results in the award of the same graduation certificate and the same fully accredited master of science degree awarded to graduates of the resident program. You will need to devote 15 hours each week to a program that is delivered to you via the Internet, one that leverages technology to enhance the educational experience. Only the resident SSC courses and nonresident Army War College course award MEL SSC and JPME II upon completion. SSC graduates are assigned to organizations based on guidance from the CAR, and Director of ARNG. Tours following graduation are to the Army Staff, the Joint Chiefs of Staff, Secretary of Defense, ACOM, and combatant command staffs in branch, FA, branch/FA generalist or joint positions." U.S. Military. To attend the United States Army War College a prospective student must be a serving colonel or lieutenant colonel with at least 16 but not more than 25 years of service at the starting date of the course. Students must have completed the Command and General Staff College, or the equivalent. To be eligible potential students must have completed a baccalaureate degree or equivalent from a regionally accredited institution. The years of service prerequisite may be waived for deserving officers by their component. Requests for waiver shall be endorsed by the applicant's immediate commander and will accompany the officer's application. Civilian. To attend the Army War College, Department of the Army Federal Government civilians must be at the grade of GS/GM-14. Other DoD and Federal Government civilians can be accepted in the grade of GS-13. Please contact the department for enrollment instructions. International Fellows seeking enrollment in the Master of Strategic Studies degree program must submit their transcripts and supporting documentation to the USAWC Registrar's Office for assessment by an outside review body to determine equivalency of their degree. Service Obligation. Commissioned officers from all components should remember that according to the provisions of AR 350-100, attendance at the Army War College incurs a two-year service obligation. Prospective students from other services or government organizations are encouraged to determine if an obligation is incurred and the extent of the obligation. Successfully complete all Distance Education academic requirements. Satisfactory completion of the individual course requirements is the only basis for receiving credit for the completion of the Distance Education Program. Possess a Secret security clearance. The Department of Distance Education's program requires a high degree of academic rigor. 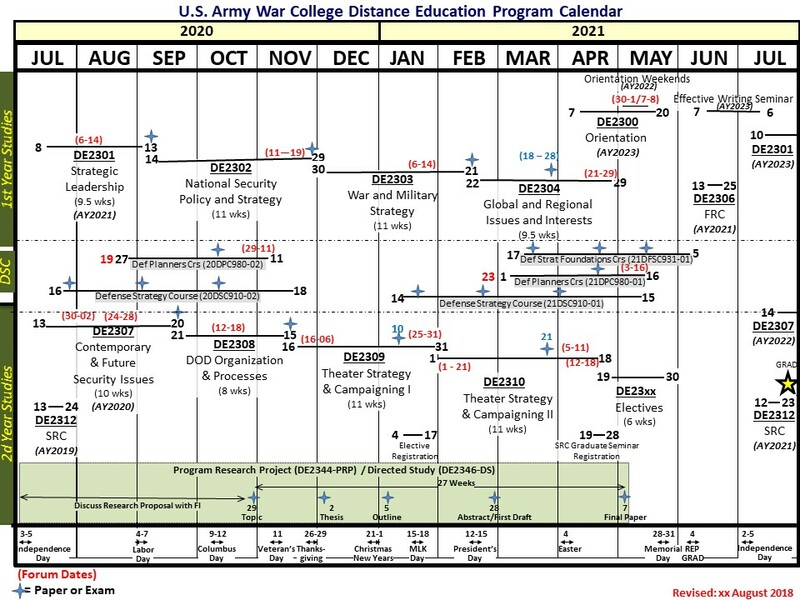 The high academic standards have given the U.S. Army War College's distance education offerings respectability in both civilian and military education circles. As a result, the Distance Education Program has been recognized as a graduate level program. PLEASE NOTE: Due to the specialized nature of the curriculum at the U.S. Army War College, transfer of credits from other institutions will not be accepted. Permanent Records. Current academic files are maintained by the Department of Distance Education. Records of former students such as transcripts and AERs are maintained in the Registrar's Office. Once selected for the U.S. Army War College, each student will receive an administrative packet, which requires immediate attention. Included in the packet will be the instructions on how to submit your biographical information via Compass. This information must be completed no later than 10 days after receipt of the packet. A required part of your records is a current photo, which must be sent electronically to the DDE Administrative Office as a JPG file not later than 60 days after your enrollment in the course. If you fail to submit your biographical information and photograph to the College, administrative actions will be pursued. Transcript. All second-year students must request that their undergraduate transcript be mailed directly from their institution to the U.S. Army War College, Registrar's Office, 122 Forbes Avenue, Carlisle, PA 17013, for verification NLT 31 October of the academic year prior to graduation. U.S. Army War College transcripts are available by contacting the Registrar's Office (email: usarmy.carlisle.awc.mbx.registrar@mail.mil). Please note, to be official, a transcript must be transmitted directly from the registrar of one institution to another. Please select a from the guides listed below.